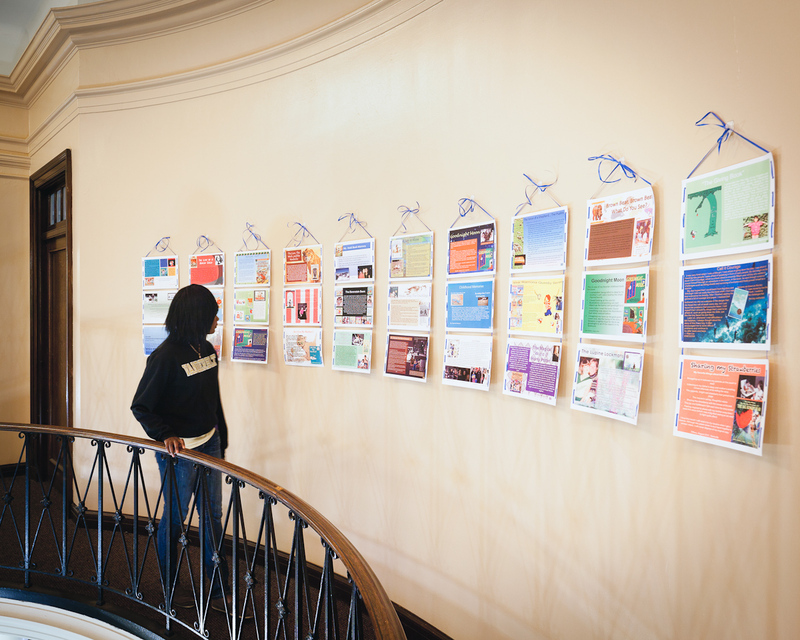 A student views the Book Memory Quilt Display at Peabody Library, Vanderbilt University. I always begin my course on children’s literature with sharing of book memories. Students and I travel back in time to the child we were at age three, seven, perhaps ten or eleven, and recall the books that held such special meaning for us at that time in our childhood. Why do we remember these books so powerfully? Often, it is who we read the book with that is most important, with many remembering the sights, sounds, and physical presence of reading with a parent. Sometimes it is the book’s role in our development of a reading identity. One student describes the first book she was able to read on her own; another describes how her love of “Eloise” led to a family trip to the Plaza Hotel in New York City where she was able to order room service, just like her favorite heroine! ; a third describes a kitchen scene where he listened to his father read aloud from the Bible and respond to his questions. Sharing book memories is always one of my favorite classes. We get to know one another better. It’s fun, and sometimes a bit emotional, as we remember “when we were young”. This year, I decided to try something different. I wanted students to share their stories with a larger audience, and I wanted to involve them in composing in a digital format. 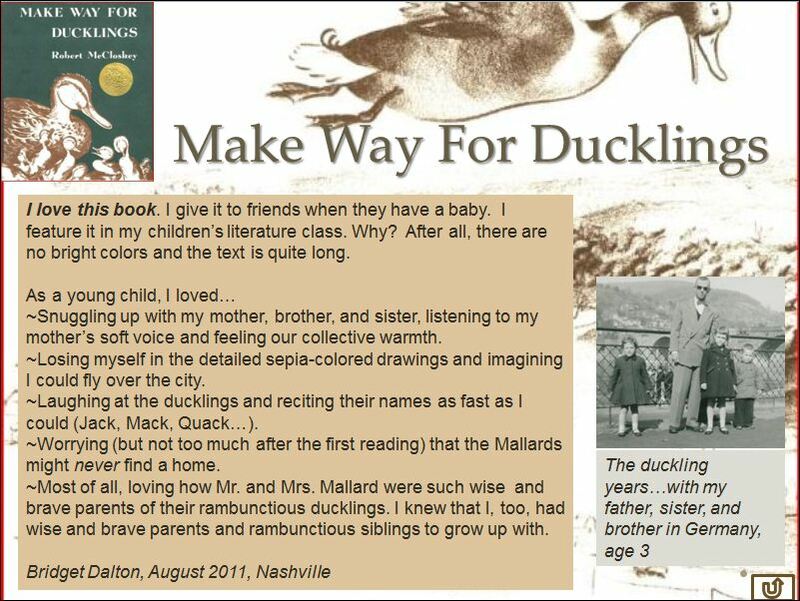 After we talked through our book memories, I introduced our Book Memory Project by projecting a PowerPoint slide illustrating my memory of Robert McCluskey’s classic tale, “Make Way for Ducklings”. I described why this book is so special to me and then talked about my visual design – my choice of an illustration from the book to serve as the background, use of sepia brown font and inclusion of a photo of my father, brother, sister, and me during my own duckling years. I explained how I made design choices in hopes that my writing and visuals would work together to effectively communicate my book memory. I recall reading “Make Way for Ducklings” with family. Students were intrigued and curious about the possibilities, so the next step was to create a hypertext anthology using PowerPoint. I provided a rubric to guide them, with the most important guideline being that they should have fun with this experience and allow themselves to be creative in both their writing and visual design. In the sections that follow, I share some examples of students’ book memories (they did a wonderful job! ), outline the project steps and provide a rubric for you to adapt. In thinking about how you might want to adapt this idea for your own students, consider first whether a book memory as I’ve conceptualized it for adults makes sense for younger children. They might not be interested in recalling a book from younger days – unless they are used as book advertisements for children in a younger grade? Another option would be to use this format as a book response activity for a favorite book they have read recently (or perhaps riff on this to capture their experience with their ‘worst’ read book of the year!). A third option would be to have students interview a parent or grandparent about their favorite book memory. For some, it may be a story told orally that they remember best, and that would work equally well. Have each student create one slide illustrating their book memory. Create a master PowerPoint and insert each student’s slide (remember to check ‘keep source formatting’ when you insert so that you don’t lose the students’ design). Let students know that they can use a first name only, a pseudonym, or a full name, depending on privacy concerns if it is to be shared publicly. Create a title slide with the title, date, and authors (see example). 4. 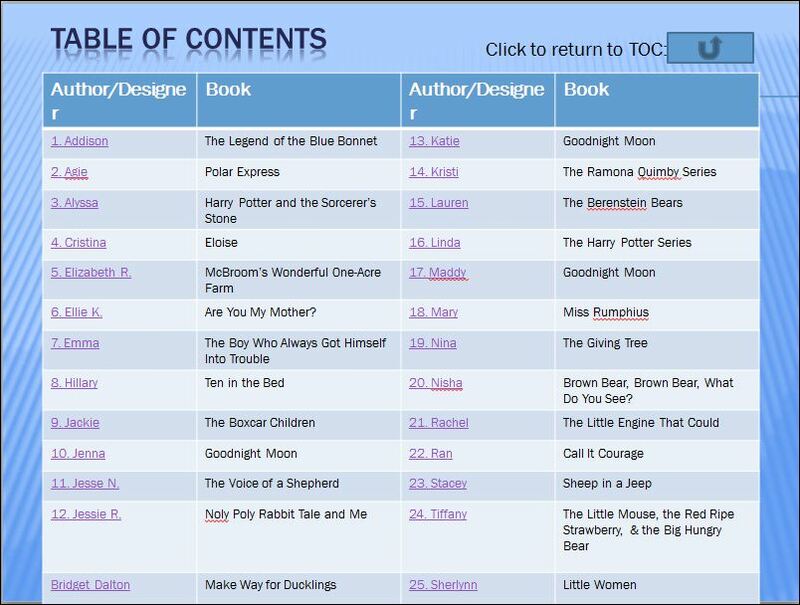 Create a table of contents slide that will be hyperlinked to each book memory. In the example below, I used the table feature to enter the student’s name and book title and then hyperlinked each name to the student’s slide with their book memory. 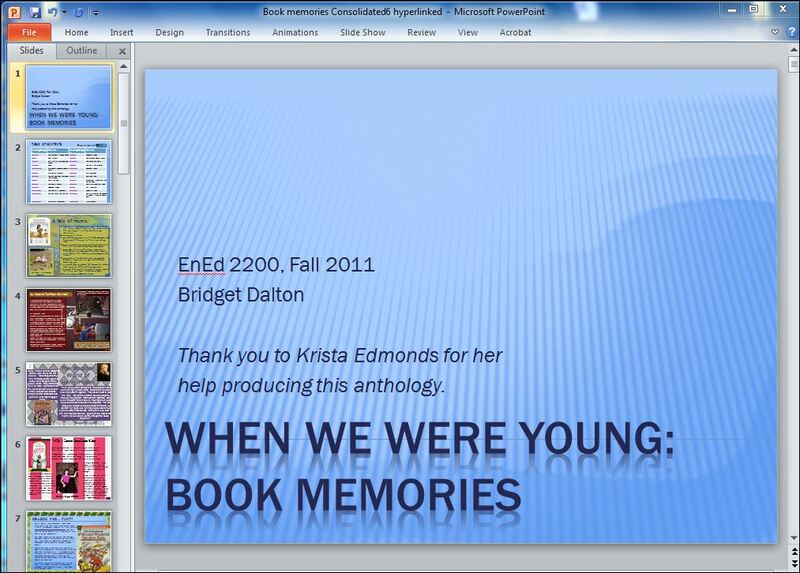 The table of contents is hyperlinked to each book memory slide. 5. Hyperlink each book memory slide back to the table of contents slide. For your first book memory link, create a graphic to serve as the hyperlink back to the table of contents. Then, copy and paste that on each of the slides (this way you avoid creating a new link to return to the table of contents for each book memory slide). 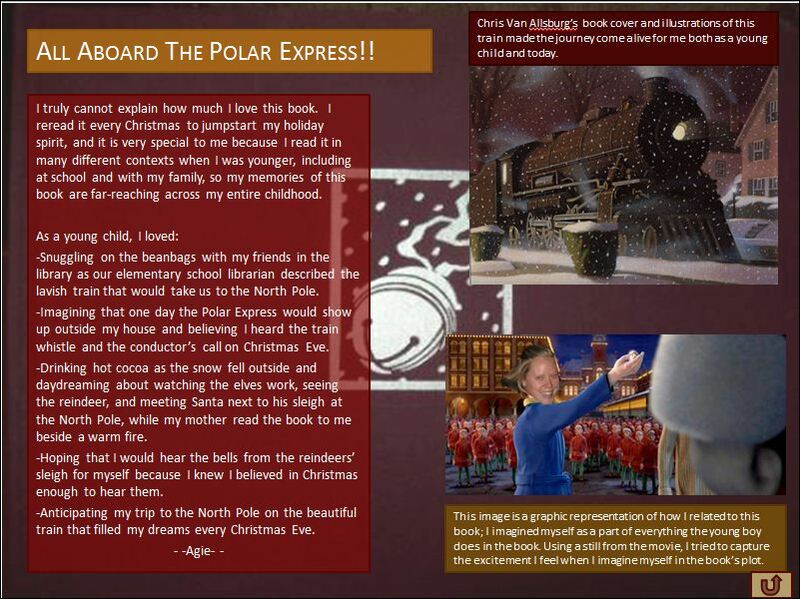 This student recalls her memory of The Polar Express. Notice how she has inserted a photo of her head onto the child’s body to show how she imagined riding the train. the arrow in the bottom right corner is a hyperlink back to the table of contents. 6. Once you’re done, test each link from the table of contents to each slide and return. 7. Save your PowerPoint anthology (or hyperlinked web page). 8. Decide how you will share the PowerPoint. You could put it on a computer in the classroom and the school library. You might also want to share it on your class webpage. I needed to asses students’ book memories to reflect their multimodal compositions. I’ve pasted the rubric I developed below. I tried to keep it general so that students would have flexibility in creating their designs (I intensely dislike rubrics that try to quantify multimodal composing such that more images are better than fewer images. We all know the power of a single image when it suits the message and intended audience!). A = Either writing or visual design are advanced, or both are advanced. B = Either writing or visual design are proficient, or both are proficient. C = Both areas are basic, or below basic (I know this will not be an option for any of you!). 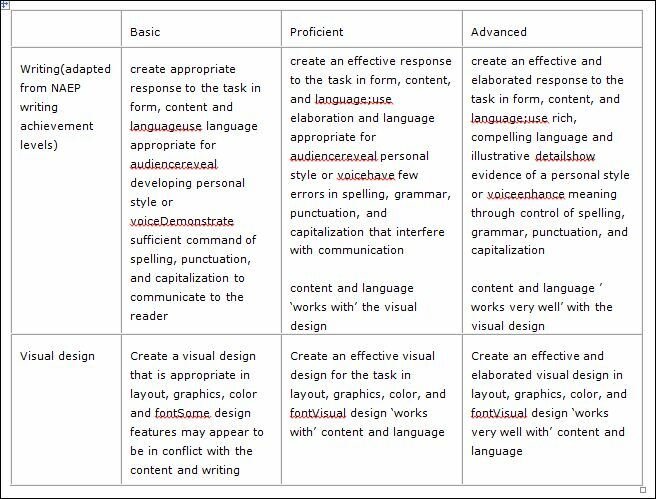 This rubric is designed to assess writing and visual design quality of the book memory. The book memory quilt created by our class is hanging in the Peabody Library for all to enjoy! We printed out the slides in color on hard stock paper and laid them out on a large table so that we could balance the colors. Next, we strung them together with ribbon to create several banners. Then, we hung the banners together to create a quilt-like display for the wall. Simply done, but quite effective! 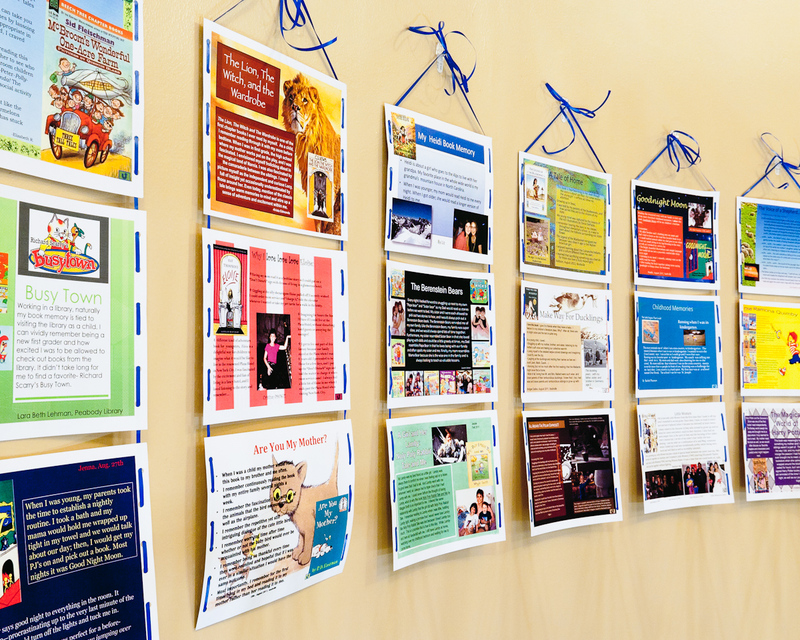 Group banners to create a book memory quilt to hang on the wall. 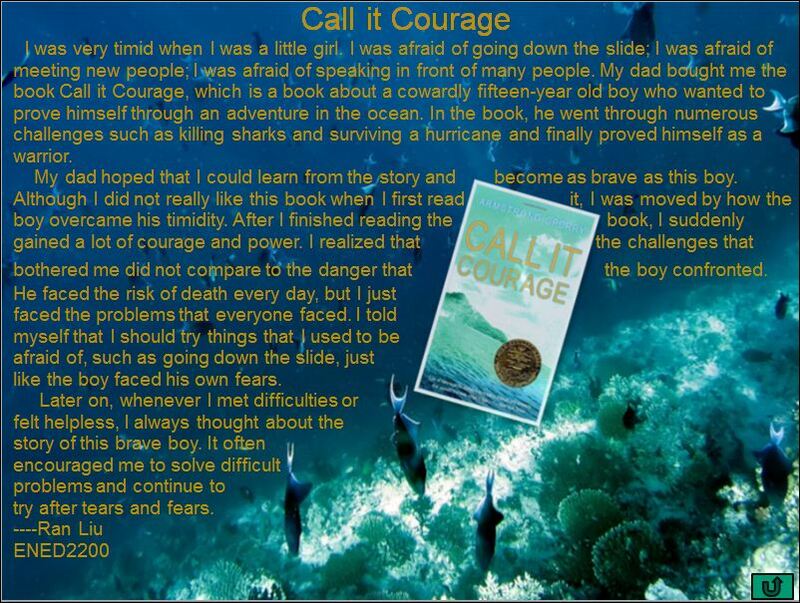 A student remembers her father’s gift of “Call it Courage” and how it helped her to be brave. 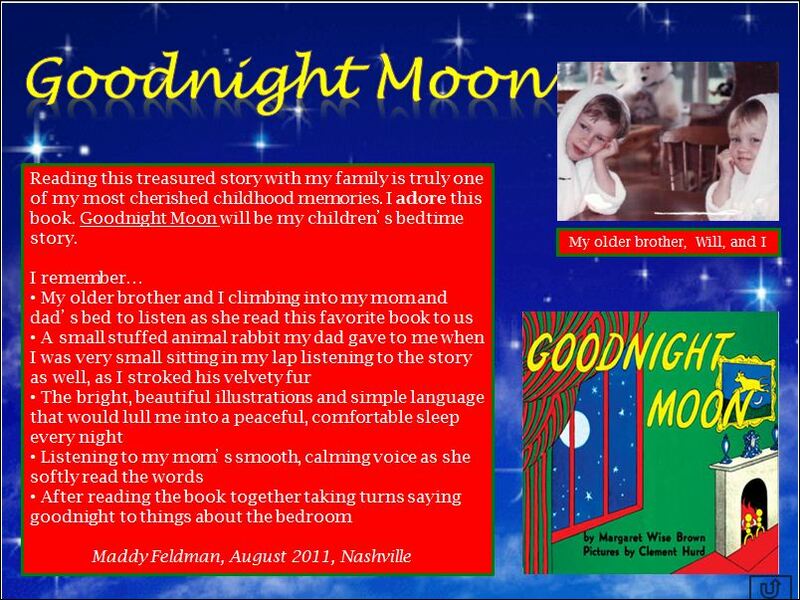 “Goodnight Moon” was a book fondly remembered by several students. Enjoy your own book memories! If you try this project out with your students (or some adaptation), please consider sharing your experience by posting a comment to this blog. I look forward to reading more book memories.